The Triple Entente promised Italy the Terra Irreccenta (Habsburg land that they traditionally thought should belong to Italy), which is why Italy joined the war. A lot of their involvement in the war was based upon a desire for national regeneration (the glory of Rome) and to unify the Italians as a people. -Very small standing army, so used mass conscription: out of about 8 million troops, 5 million were conscripted. "Mutilated Victory" Although they gain a lot of territory, they do not get Dalmatia or Fione. If the government had been more active instead of complaining, Italy could have taken the severely weakened Austria-Hungary after the war. This 'relative deprivation' spread dissatisfaction with the government and eventually fuels support for Fascism because it called for "action." 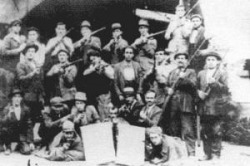 Fascism as the "Third Way"
The Biennio Rosso paved the way for the 1921-1922 Biennio Nero. The government could not guarantee the people any safety during the communist scare, thus losing all credibility. Mussolini said he would guarantee the safety of the people, promising to get rid of the communists and the weak liberal government. His nationalistic views also made the Fascist party quite appealing. -Ras and squadistri take over 4 major cities in North and plan a march to Rome. King Victor Emmanuel III wants to replace the Prime Minister Luiji Facta with Mussolini because the King wants to appease the radicals yet thinks he can control Mussolini and so doesn't stop him from coming. Facta resigns in protest and Mussolini is appointed. Only then do the blackshirts march on Rome. -Corfu Incident: Italiant general gets murderd on Corfu and Mussolini blames the government of Greece, even though they were totally blameless. They will not pay a fine or anything, so Mussolini attacks (furthering his popularity) and because the Greeks don't want to fight, they pay money. -10 June: Mussolini's longtime rival, Giacomo Matteolitti (Socialist Leader) is murdered and Mussolini is blamed. -He gives a speech saying that he didn't know that his party members were going to do that. -Party tells him to shift right, be stronger or be replaced. The squadistri were loyal to the Ras(regional leaders) not to him, so he needs to do what they say. Mussolini, unlike Stalin, did not have time to 'pick off' members, plus there were no internal conflicts to give him the excuse to do so, so he does not have the unwavering loyalty of the party. -6 September: First assassination attempt in which a lady Socialist missed (except for a small bit of his nose). Mussolini creates henchmen: Podesta (instead of Ras), who are locally 'elected' leaders appointed by Mussolini and as such are personally loyal to him. OVRA- Security force devoted to the state –aka Mussolini (unlike the MVSN who were loyal to the party). Judicial reforms: changes in judge appointments and removes trial in some cases. Mussolini can issue imprisonment orders. Mussolini starts using the title "Il Duce"
Electoral reforms: Must be male, at least 21, and a fascist. -Takes papal lands, but gives church 30million lira –the Vatican can be an independent country with Italy's support. -Mussolini develops his Cult of Personality with films, flashy speeches, state-run schools (teachers must be fascists…however, there were still Catholic schools), and mandatory youth organizations (despite this about 40% of youth never joined). -establishes a corporate state: making monopolies that are privately owned, but regulated by the state. crisis, Italy now has to import wine, olive oil, and meat. In order to restore the value of the lira, Mussolini makes exports more expensive, in effect just "saying the lira is worth more." This battle was a huge failure as the Italian market was too small and businesses could not sell their goods. Things cost more for the Italians afterwards. To increase the population, divorce and birth control are outlawed (homosexuality is outlawed in 1931). Contests are held to see who can have the most children in 10 years are held and women are discouraged from working. This is highly ineffective as women needed to hold a job to support their families already. Drains marshland to try and increase farming land, but too expensive. This project results in only a 3% increase in land, but it did give jobs to many people. Mussolini tries to save the banks by improving industry. However, the 9% industry increase during Mussolini's rule did not even keep pace with the inflation rate. However, there were significant decreases in the imports of raw goods and transportation was much improved. Mussolini's lack of success in this area was not entirely his fault as Italy does not have a vast supply of natural resources. Only after his alignment with Hitler did Mussolini have anti-Semetic policies. This Charter took away most of rights from Jews, but it was not strongly enforced, even by the Duce himself (he had a Jewish mistress –Margueritta Saffarsi), except in the more metropolitan north. Mussolini regards himself as the International Leader of Fascism and spends a lot of money supporting Fascist groups in other countries. This is not actually ideologically sound, as Fascism is based on nationalism and nationalist expansionism. Binds Italy and Germany –if one goes to war then the other will do so immediately after, giving full support of all armed forces- land, sea, and air. Mussolini made many mistakes during World War Two. He trusted Hitler not to start the war until Italy was ready and always overestimated Italy while underestimating his enemies. The Duce refused to accept German aid in North Africa and his attack in Greece was a long period of failures (when Germany bales them out, the Nazi's win in only 2 weeks). 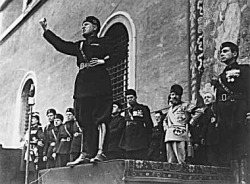 The Allied success in Tunisia and the continual bombings of Italy, combined with the severe food shortage and Nazi presence in Italy, turned public sentiment away from Mussolini. A prominent Fascist, Grandi, moves a resolution requesting that the King re-assert full constitutional powers after Mussolini announces that the Germans are going to start evacuating the south. Mussolini and Clara Pettacci are arrested by communist partisans as the former Duce and his mistress were en route to Switzerland. Mussolini and mistress are executed. The bodies are taken to Milan and hung upside down from meathooks. The civilians desecrate the bodies, throwing stones, spitting, etc.